Mugwort plant, Artemisia vulgaris, is also known as Wild Wormwood, Felon Herb and Cronewort. Leaves used in European cooking to flavour fish dishes and fowl dishes. Flowers and leaves are the base of a herbal tea, a Modern folk remedy for nausea and vomiting. Also brings relief to muscular cramps (use as an oil rub or in bath water). A traditional ingredient in the medieval witches formula for flying ointment. Used to induce of dreams. 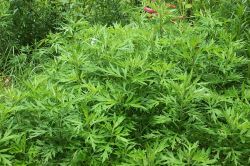 Mugwort plant is a native of Europe and is adaptable to most soils and conditions. Spikes of small yellowish flowers in summer. Drought and frost resistant. A perennial shrub, growing to 1.2m x 1.5m. Be the first to review “Mugwort, plant” Click here to cancel reply.